Ever notice how European women always look youthful and radiant regardless of age? It’s like they’re taking aging gracefully to another (possibly supernatural) level. 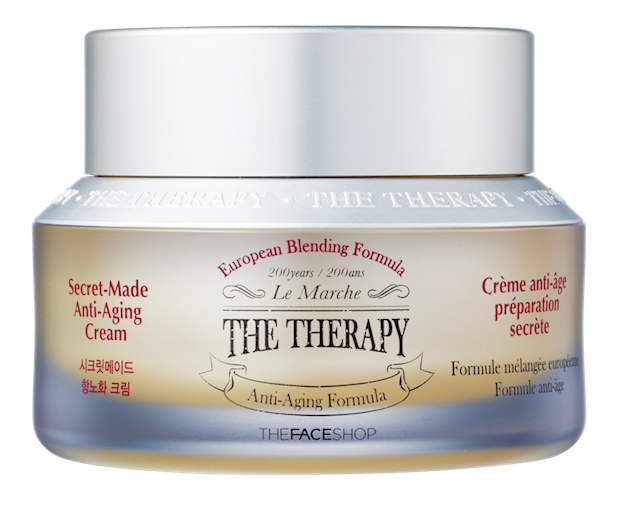 The Therapy, a new line within THEFACESHOP brand, borrows from 18th century ethnobotany, a natural blending method that originates from the Le Marche region of Italy. By using modern processing methods like vacuum kneading, which ensures the product isn’t compromised by outside elements like excess oxygen, and centuries-old techniques like the oil drop method, The Therapy encapsulates the science-meets-beauty philosophy. The hand-blended recipes incorporate a variety of botanical ingredients chock-full of antioxidants and are translated into four distinct products that boost radiance, even out skin’s texture and moisturize: Essential Tonic Treatment ($30), Essential Formula Emulsion ($35), Oil-Drop Anti-Aging Serum ($45) and Secret-Made Anti-Aging Cream ($40). But you can tell everyone who asks that your glow is magic. The Therapy will be available in mid-February.